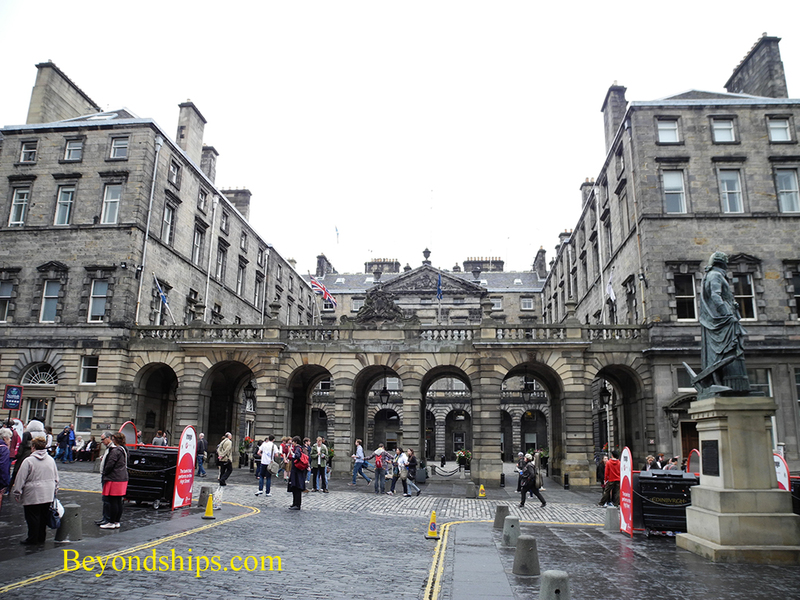 The Royal Mile is one of Edinburgh's most popular tourist areas. It is primarily of note for its landmark buildings, historical sites and museums. However, it also has numerous cafes, pubs and shops along its length. Running from Edinburgh Castle to the royal palace at Holyroodhouse, the Royal Mile is one Scots mile long (approximately 1.12 miles). Although it goes in a straight line and appears to be one street, the street name changes several times. The Royal Mile begins at Edinburgh Castle (see separate article). Leaving by the east gate, the first area you traverse is the Esplanade, a parade ground laid out in 1753 (left). 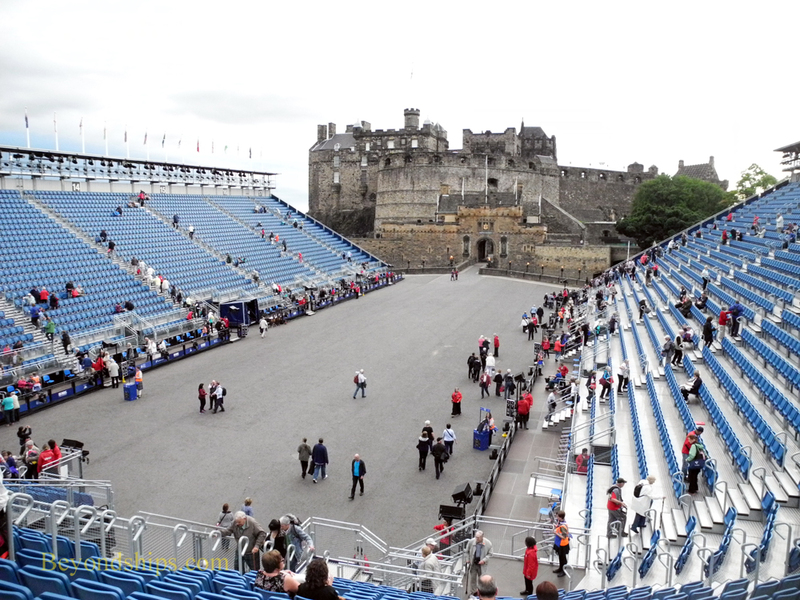 In August of each year, it is turned into a stadium where the Edinburgh Royal Military Tattoo takes place. The first actual street on the Royal Mile is Castle Hill. There are several popular tourist attractions here. The Scotch Whisky Experience (lower left) tells the story of the famous Scottish beverage and houses a replica of a distillery. Down the street on the other side is Camera Obscura in the Outlook Tower (below). In the 19th century, Maria Short installed a camera obscura at the top of this tenement, which showed views of the city. The camera is still in use and along with other exhibits is open to the public. Tolbooth-Highland-St John's Church (upper right). 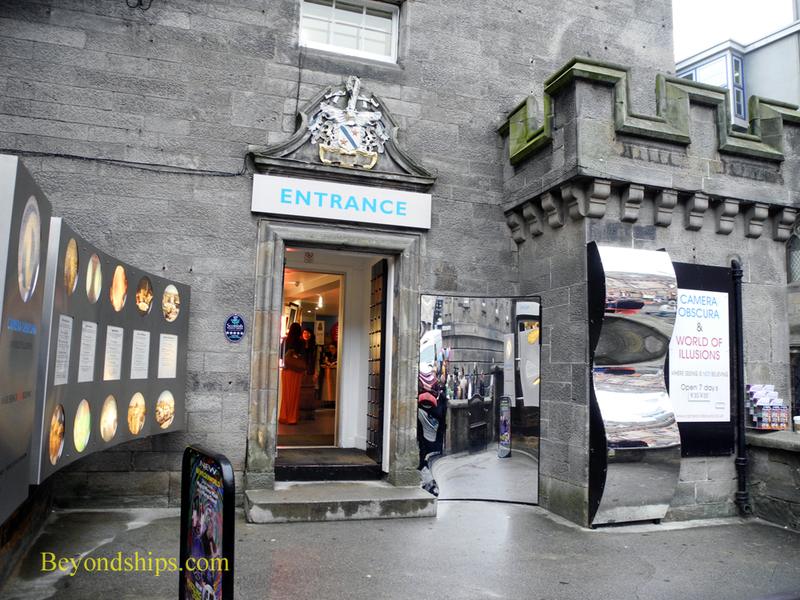 It is now called "The Hub" and is an information center for the Edinburgh International Festival. Walking down the hill, we come to the Lawnmarket area. Here, are some examples of the high rise tenements that once characterized Old Town. Because of the lack of space in old Edinburgh, multi-story buildings were created to house the populace. Leaving the main street by a narrow passage, you enter a courtyard with a number of these tall buildings. 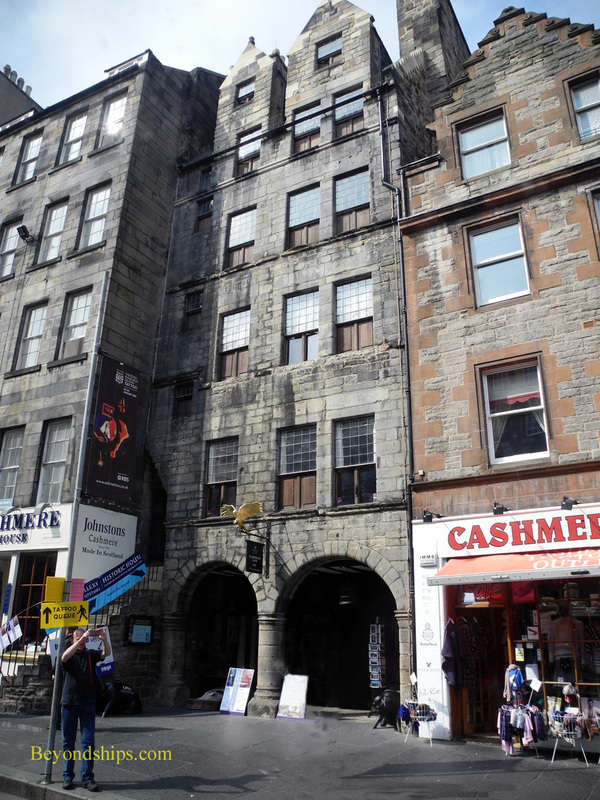 The most interesting is Lady Stair's House (above), which now houses the Writer's Museum with artifacts relating to Sir Walter Scott, Robert Burns and Robert Louis Stevenson. Back on the main street, Gladstone's Land (right) was built in the 17th century. It has been restored and shows how people of all classes lived together in these tenements. The street has now become High Street. At the intersection of High Street and Bank Street, look left to see the Bank of Scotland (left). Crossing Bank Street, you enter into Edinburgh's legal community. The building on the left hand side with the statue of David Hume in front of it is the High Court of the Judiciary, Scotland's highest criminal court. 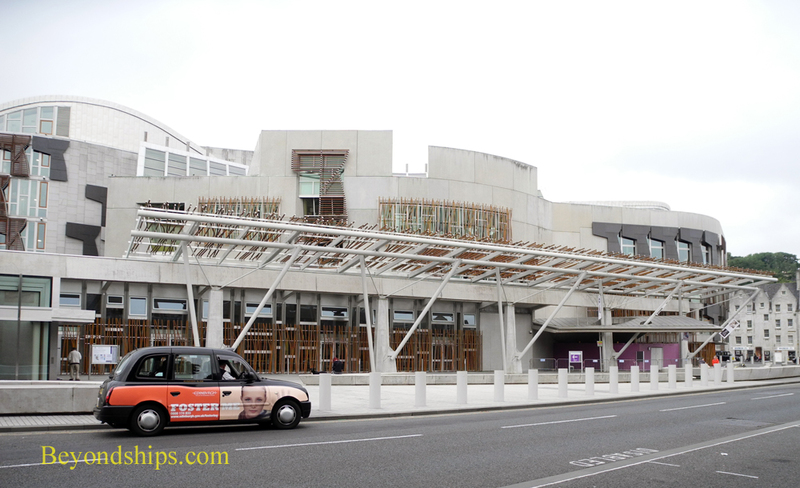 On the opposite side of High Street is Parliament Square where the old Scottish Parliament used to meet. It is now the home of the Court of Session (left), Scotland's highest civil court. The statue in front is of King Charles II. 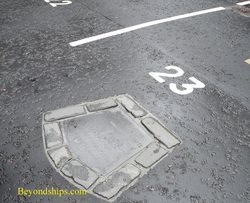 The court's parking lot covers an old burial ground and religious leader John Knox's last resting place is marked along with the parking spaces. 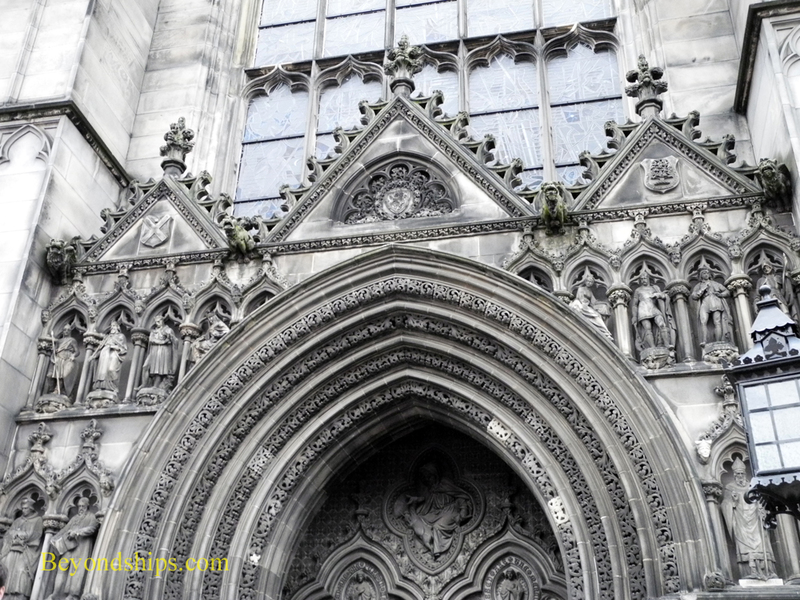 Next to the Court of Session is St. Giles Cathedral. Built primarily in the 14th century, there are parts that may date even earlier. It was remodeled in the 19th century. 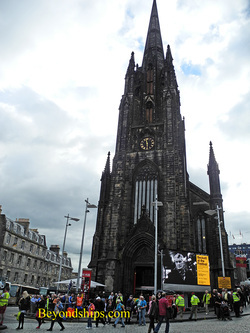 Part of the Church of Scotland, it is the city's principal place of worship. 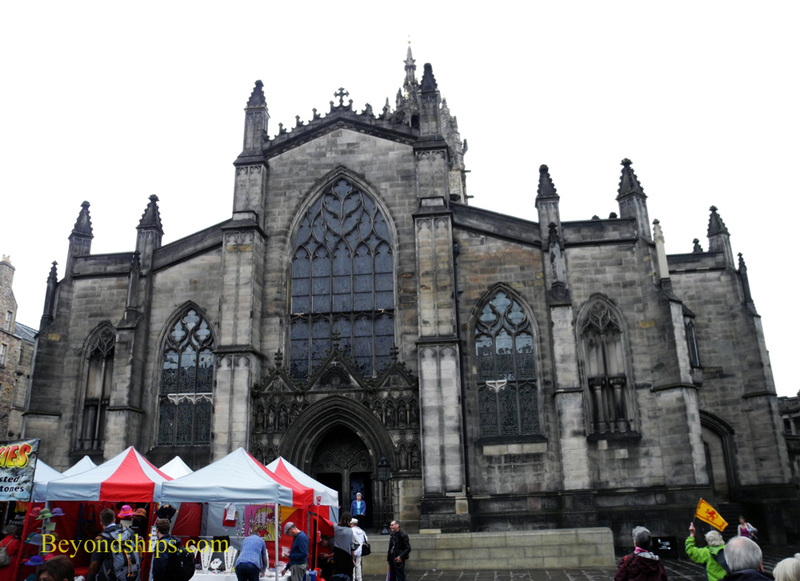 Behind St. Giles is the Mercat's Cross (left). Proclamations were read, merchants met and sometimes punishments were dealt out at the cross. Across High Street is the City of Edinburgh Council Chambers in the old Royal Exchange (below). The steeple, which dominates the view looking down High Street, is the Tron Kirk. Built in the 17th century, it ceased being a church in 1952. Located where the street narrows is the John Knox House (above), which is associated with the Protestant religious reformer and which dates from 1490. It is now part of the Scottish Storytelling Center. Proceeding further down the hill, the street name changes to Canongate. 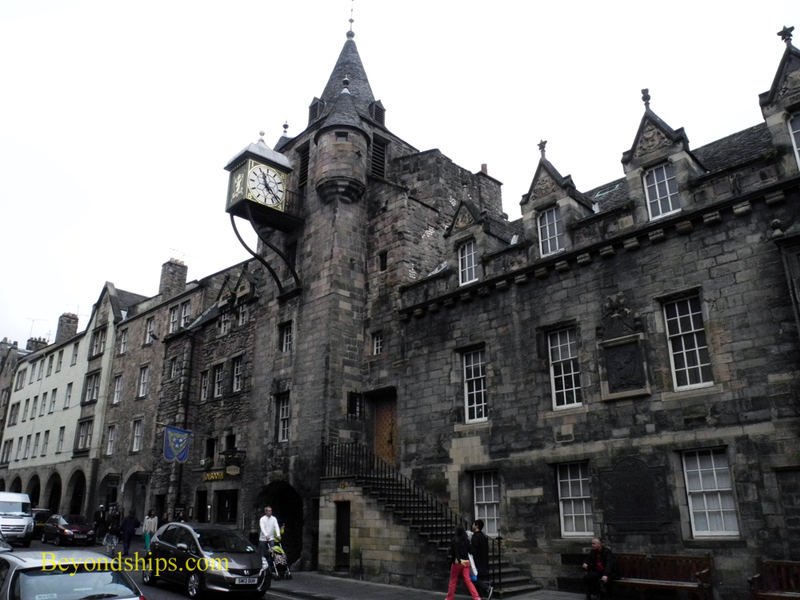 Canongate was once a separate burgh from Edinburgh and on the left side of the street is the Canongate Tolbooth (upper right), which is where travelers paid a toll to enter the burgh. Built in 1591, it has also been used as a prison, a courthouse and a tavern. Today, it houses a museum called "The People's Story." On the opposite side of the street are a collection of 16th to 18th century buildings that make up the Museum of Edinburgh (right). Moving further along, there is the Kirk of the Cannongate (left). 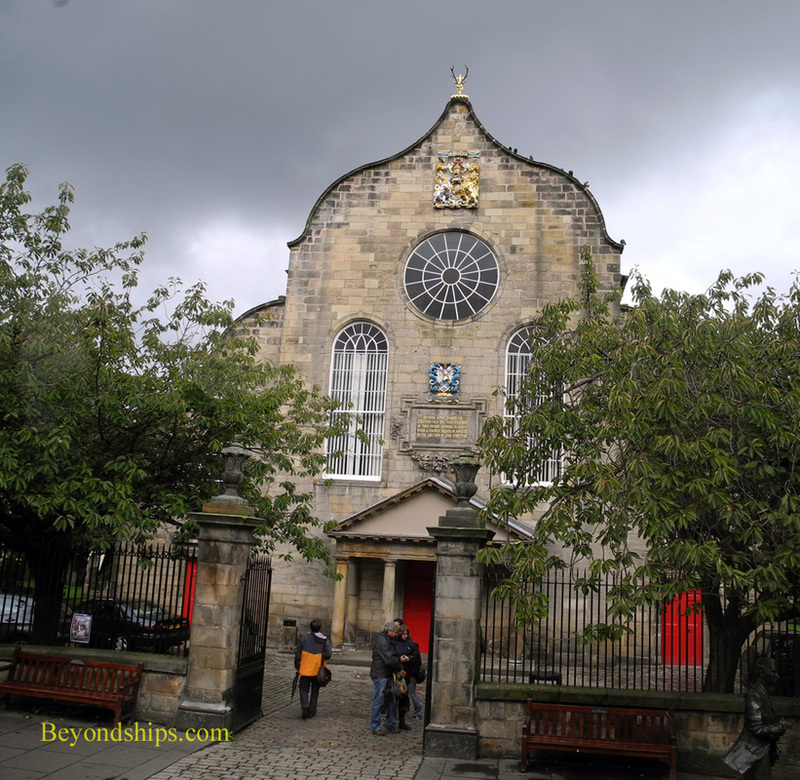 Completed in 1691, it is the last resting place of Adam Smith and of Mary Queen of Scots' secretary David Rizzo, who was murdered in front of her. More recently, the Kirk was the scene of the marriage of Zara Phillips, Queen Elizabeth's granddaughter. On the opposite side of the street is the architecturally controversial Scottish Parliament Building, which opened in 2004 (below left). Queensbury House is now part of the Parliament complex (below). It dates from 1686 and is said to be haunted by a servant boy who was roasted and eaten by the Earl of Drumlanrig in 1707. 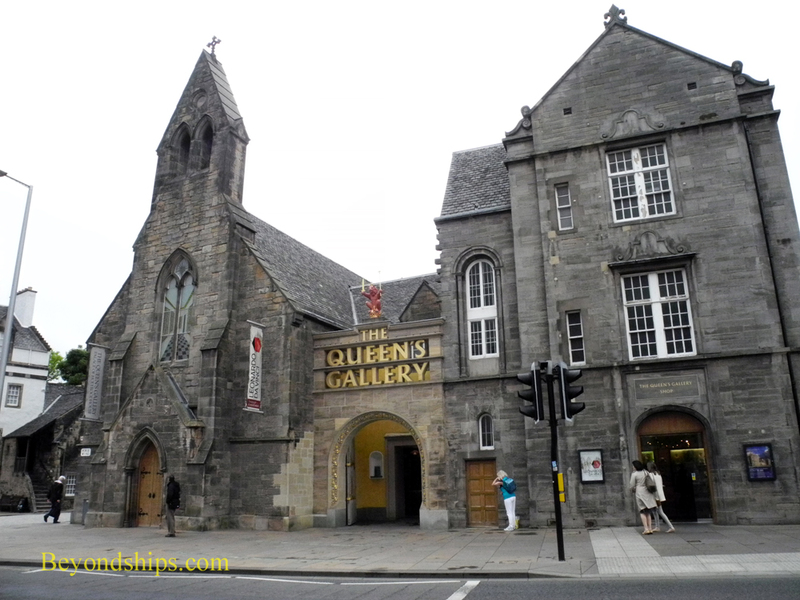 At the end of the Royal Mile you come to the Queen's Gallery (above), which is used to show works of art from the royal collection. 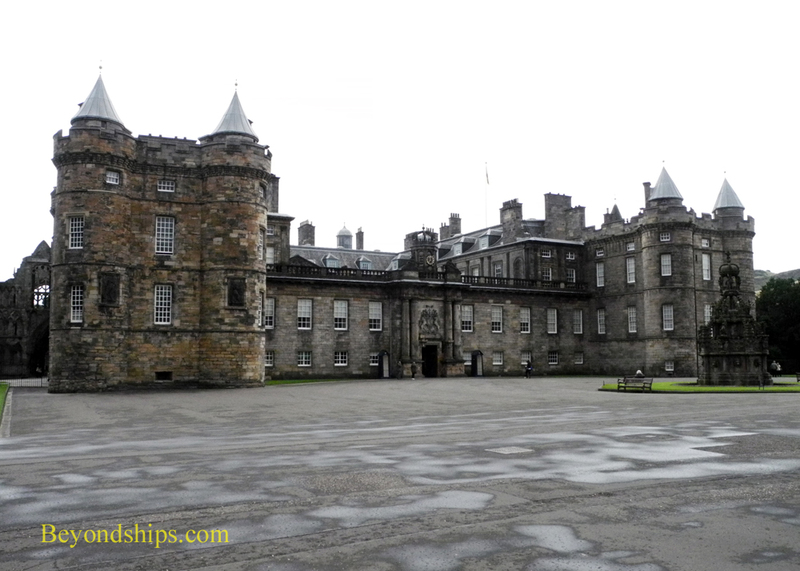 Behind it is the royal residence Holyroodhouse Palace (right; see also separate article).